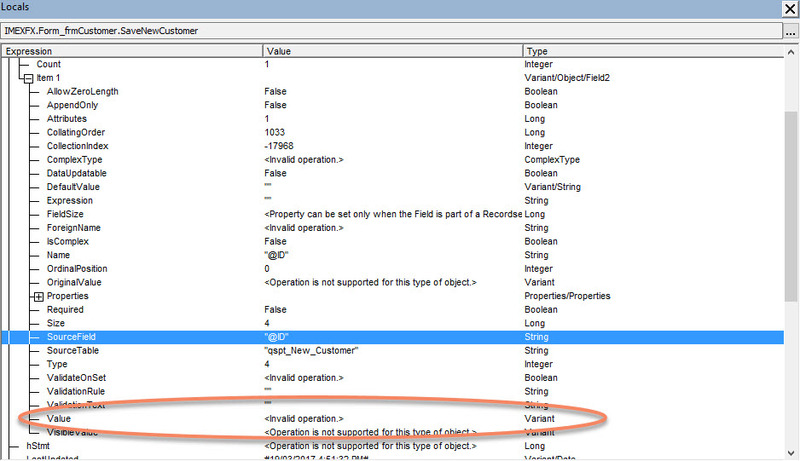 How can I use output from a stored procedure in VBA coding? The VBA coding calls a stored procedure to add a new customer by passing all of the relevant fields except the new customer ID. The stored Proc has a transaction that determines the next ID and then inserts the customer using that ID before committing. The ID is returned as a declared output parameter and the return code is set to 0 for success, 4 for failed insert. 2. Fill in the form with the new customer ID. But I cannot find it in the querydef properties. Have the sp return a recordset with the values you need. Within the MS access I can see that there is a qspt with the result I need. But I just cannot find the right commands to make it available to the VBA code. MSDN has an explanation, but I have not been able to work out how to use their explanation. How embarrassing! I have a workaround. My attempts to use a recordset failed with this stored procedure. It may be because the stored procedure has a begin transaction and begin commitment. But I was able to determine the ID from the parameter. MsgBox msg, vbInformation, "Form Customer"
MsgBox msg, vbExclamation, "Form Customer"
Nigel, is this issue solved?